Like so many of our favorite Retro Things, these shades are a lot of things. They're a bit kitschy, a bit 80s, and a bit baffling. You may not notice until you look at the photo closely, but I've got little plastic skiers on my sunglasses - and yes, that's just my nose in the photo. It's not a ski hill. The copyright is 1988 on "The Original UnexSpecTed" glasses. The copy on the back refers to the glasses as "wearable art", and petitions the wearer to treat them tenderly. No doubt about that - these little skiers are quite fragile. I don't like to make fun of someone's art, but is gluing some model choo-choo figures onto a pair of cheap sunglasses really "art"? I bought these in the 80s at a thrift store for a buck or two, sparing me the undoubtedly high art fair price someone originally splashed out for these specs. I'd love to know what the original price was. I think I've worn them once because they are just so fragile. I only wear dark glasses in the summer, and having little skiers shooshing around my eye sockets seems both out-of-season and hypocritical. I've only ever been skiing once (very unsuccessfully). I get the idea of wearing sunglasses on the hill so you don't go snowblind, but these little plastic ski bums on my specs wouldn't make it through the bunny hill. If you're ever going to wear UnexSpecTed glasses, I think it best to simply perch them gingerly on the end of your nose while you're sipping cocoa back at the lodge. That's right... these may be cheap sunglasses from the drugstore, but gluing on the skiers merits a "handmade in the U.S. A." sticker I guess. Oh, and in case you're wondering about the comfort and visibility of UnexSpecTed glasses, having tiny people and a little pine tree in your blind spot isn't all bad. That part of my face always needed a little sprucing up (that's conifer humor, son!). What do you think? Lame excuse for an objet d'art, or cute and clever novelty? Should we try to find artist T. R. Peters and ask him? The atomic age office brought with it reams of typing, work which was usually reserved for women. Underwood, the famous typewriter manufacturer, responded to a consistent complaint of secretaries; chipped fingernails. Instead of chuckling at the stereotype, let's examine Underwood's two-pronged solution - a newly shaped typewriter key, and Underwood nail polish. The Underwood 150 introduced half-moon shaped keys, giving long fingernails a chance to slip into the spaces between keys rather than striking the usual large button-shaped keys head on. Now you can preserve your blood-red talons rather than risk (quoting the ad): "short unfashionable fingernails". The typewriter also promised "kitten soft" key action (who writes this stuff? ), so you don't have to mash your fingers down on the keys so much just to make the 150 work. I'll remember that next time I'm slamming out my resume on a baby cat. The other tool to keep your fingernails and hands (again, quoting the ad...) "lovely to look at, lovely to touch" (they're not encouraging inter-office hanky-panky here, are they? ), Underwood also introduced their own nail polish. It looks like it might have been more of a free marketing come-on rather than something you'd pick up at the five and dime. The "Underwood Red" polish promises durability above all, and claims to have been styled by "Beauty Consultants". After thinking about it, I suppose the combination of impact-resistant nail polish and the specially-shaped keys on the 150 could actually have helped eliminate the irritation of chipped nails. Though, why didn't that half-moon key shape stick around? Next time you see a woman with smashed up fingernails that can only be battle scars from a mid-century typing pool, maybe you can ask her for us. This year will see a lot of Atari celebrating the founding of the company 40 years ago. You can expect that we'll do our fair share here on Retro Thing, but you may also see some retro punters take a shot. Target has teamed up with General Mills to offer kid's cereals in classic packaging (again). The idea is to bring back some of that 70s vibe when all that mattered on a Saturday morning was slamming down some Lucky Charms, watching SuperFriends and edging up that Space Invaders score. The nostalgic packaging is cute, but the "Atari Activities" promised on the box are a little pale. Let's ignore the fact that a sterile name like "Atari Activities" doesn't exactly sound "Totally Radical". of the box has some puzzles and riddles that I'm not sure would actually engage the kids who are supposed to eat the cereal, or even a retro gaming hound like me. There is an online version of Centipede you can play, so I guess that's something... but I was hoping for at least a lame 70's era cereal prize like an Atari sticker, or a patch or something. It would be great to have a little souvenir of so many years of Atari fun. I don't fault General Mills for cashing in on Atari nostalgia, but I am disappointed that they cheaped out so badly. I've joked many times that collecting records qualifies as a "lifestyle choice". Once you're bitten by the vinyl bug, you'll find yourself scouring the bins at collector shops, scanning the tables at flea markets, and sorting through boxes at the thrift to find your next treasure. It doesn't take long for the records to start stacking up and needing a home of their own. When LPs were more of a mainstay, there were plenty of storage choices out there, but these days its often specialized and very expensive. That's what makes IKEA's Expedit shelving system a godsend for those of us who have too many records. 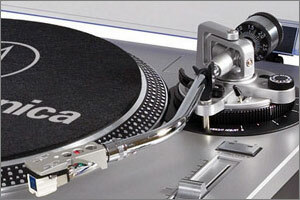 The biggest one costs in the range of $200, and is perfect for holding thousands of records. Once I'd discovered this for myself, I started sharing the word and found that many of my other record collector friends found the same solution. I've had mine for close to ten years without a hint of sag (you can even see mine in the background of episodes of Retro Thing TV). So there is a whole network of DJs and vinyl fans who have made the trek to their local IKEA (or Amazon) to find a home for their LPs. A clever Kickstarter project just secured the funding to create a set of front doors for the Expedit that would also display your favorite LP art. I'm totally on board as it's not only stylish, but it's easy to change the whole look of the unit with a whim. Though because it's a small run, it looks like it won't be able to match IKEAs usual economy for these sorts of things i.e. it's not going to be IKEA-level cheap. Looks like we're talking $35 per door. Even more, I'd also really like IKEA to get on something like this custom DJ booth a friend turned me on to. Let's make it happen, IKEA - I hereby dub this fantastic contrivance the Expedit 360! No Ikea nearby? Order your Expedit from Amazon. From time to time we like to march out a bit of retro tech that we have no idea about. It's a lot of fun for us to watch the discussion light up in the comments section of a post with guesses as to what it is we've found. It used to take a lot more work/solder/toggle switches to jailbreak a phone, leaving it bare or your own purposes. Here's how retro telecom geniuses used to do it. This device looks like it started life as a rotary phone, but then got the deluxe accessory package. In place of the dial, we've got a perfectly fitting speaker with the Motorola logo. The handset has a red earpiece and microphone (with a particularly nasty red rubber earcup added). The receiver has a red momentary push-button near the earpiece. You can see the red & green indicator lights on top near the cradle as well. Moving to the front, there are three toggle switches. A three position toggle dutifully DYMO-labelled "SQU", and two more marked "DIR" and "SPKR". There are also what look like two push-buttons, but I think they're lights as well. On the side is a serious looking "A.F. GAIN" knob, and in the back is a 1/4" jack. I want to think that this may have come from the Motorola factory that's relatively close by, but I supposed Motorola could just be the brand of the speaker (which fits perfectly where the dial used to go). The phone is a standard Western Electric chassis (the phone I grew up with was a cousin to this one). It's a bit homebrew and cobbled together, but clearly by a pro. I doubt this was a commercial product, but nor do I think it's a HAM operator's afternoon's fun in the workshop. If you scan the ads inserted in your Sunday paper in the coming weeks — you do subscribe to a Sunday newspaper, right? — you'll notice many stores holding sales on organizational gear like storage bins. I assume that's either because people buy a lot of that stuff after receiving too many Christmas presents or because "getting organized" is a common New Year's resolution. Either way, it's fair to say we're entering the organization season. And if there's one thing a competent organizer needs, it's a labelmaker. Dymo has been making and selling labelmakers since 1958. The company started out making them for industrial and business clients. (In its old ads, Dymo said its reps would happily come to your place of business and label "any six items" to show off how useful the labels were.) The technology is dead simple: Select a letter on the font wheel, squeeze the trigger and the raised letter is pressed into the malleable plastic or metal substrate. The plastic would turn white from the stress of being stamped, making the label easy to read. The firm lays claim to introducing the first personal labelmaker and it democratized the gizmos with inexpensive embossers. It sold a range of machines, from simple plastic ones for home use to metal "executive" models with carrying cases and multiple font wheels. Other companies got into the game and soon seemingly everyone had the ability to punch out labels for things that clearly needed no marking. (I mean, did anyone actually put their phone number on their sunglasses?) In the 1970s, the company sold 7 million embossers per year. Though they might seem slightly antiquated in this age of customizable print-your-own labels, I have noticed that embossed labels are still relevant. The Dallas Cowboys continue to use the labels to denote which helmet belongs to whom. You can get fonts that look like the embossed labels, so that your next PowerPoint presentation can have that extra pop. And of course the embossing font motif pops up in logos: The NBC show "Chuck" uses it, presumably because the labels were once a staple of retail nametags, and the Paramount Vantage movie imprint relies on it too. I find them fun to use but also finicky and occasionally laborious. My model seems to regard the font baseline as mere suggestion; spinning the font wheel in same direction sometimes helps. The key to consistent lettering is even finger pressure on the trigger, which is a challenge. Then again, those innate errors are definitely part of the charm. And surely charm is what you're after when you label your new storage bins. Reports are coming in that folks are snapping up remaining stocks of incandescent bulbs before the end of the year. January 1st marks the start of the Federal phaseout of traditional light bulbs in the United States. While many are unaware of the upcoming ban, 13% of U.S. residents are reportedly stocking up on the 130 year old symbol of American ingenuity and invention. Home Depot has reported higher than normal sales in these last few weeks as they blow out their back stocks. I'll admit, I picked up a couple dozen bulbs myself. Yes, I too have joined the Incandescent Underground. I have mostly replaced the lights around my apartment with CFL and LED lights, but there are a couple of old lamps that just don't look right with new style bulbs. There's also a fixture in a dark and cold corner of the apartment (where I tend to write Retro Thing posts, coincidentally) where I actually rely on the little bit of extra heat kicked off by the bulb. There are those who are turning this into a political issue, unhappy that the government is regulating what they can and cannot stick into their sockets. The Republican House has blocked the funds that were originally allotted for enforcing the January 1st ban (make of that what you will), and enterprising bulb sellers have come up with all kinds of strategies to keep you filled with filament fired light. One outfit has gone so far as to relabel their incandescent bulbs as mini-heaters. Yup - that's how we'll save the planet... why address a problem head-on when we can just relabel it? I'm sure that the news will feature those outliers who will only defy the darkness with old fashioned bulbs, and we will certainly hear many stories of folks who have their garages packed to the ceiling with old fashioned bulbs. Maybe we'll see an inflated future market for light bulbs the same way as we've seen for high flush toilets (Hard to believe, but yes... I recently read about an older high flush toilet changing hands [ewww] for $600 on Ebay). Here's another question that no one seems to be addressing. A lightbulb floating over someone's head has ong been the symbol of a bright idea. What'll it be now? A CFL? An LED? I'm going to look pretty weird walking around with a diode floating over my head.